Your business’ parking lot is one of the first things customers will see, so don’t let their first impression be filled with cracks and deterioration. You don’t have to spend thousands and thousands of dollars repaving your entire parking lot to get the look you want. All Out has a much more affordable and functional solution: it’s called sealcoating and it’s what we do best! All Out is a Delaware County commercial parking lot and sealcoating company that’s been proudly serving the area since 2011. We use a 7-Step Process that serves as blueprint for our success in maintaining and beautifying your property. The experts at All Out don’t waste any time – we know exactly what your lot needs and will explain all of the available options for the best prices around. Extends Pavement Life – A routine sealcoating can double the life of your asphalt. Your go-to Delaware county commercial sealcoat experts at All Out recommend getting this done every 2 years. Saves Money – With sealcoat, you can protect your parking lot against harmful elements for just a fraction of the cost of new asphalt. Prevents Water Penetration – Water is one of asphalt’s biggest enemies. 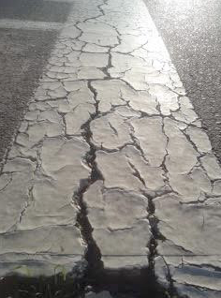 Since asphalt is porous, water can seep through any cracks and disturb it. Sealcoat, however, has water-repelling agents to prevent this disruption. Slows Oxidation – The sun causes essential oils in the asphalt to dry out and get brittle, making it more likely to crack. Sealcoat will help slow down this process. Improves Overall Look – The rich, black finish of sealcoat will enhance the entire look of your property. At All Out, we complete projects with passion and take pride in beautifying and protecting your property. Every job is a showcase project for us and we understand the magnitude of the opportunity we have to work with you. Contact This Delaware County Commercial Sealcoat Company Today! 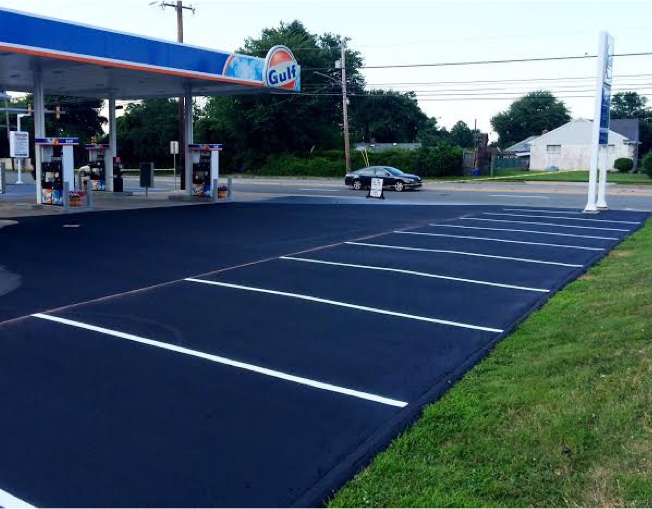 When you’re ready to give your parking lot the TLC it needs, call All Out – the most trusted sealcoat company for commercial parking lots in Delaware County. Along with excellent workmanship, All Out provides our clients with videos of our entire process. This sets us apart because it promotes accountability on all ends. We believe we’ve set the bar high with our technological ability to communicate with clients effectively. 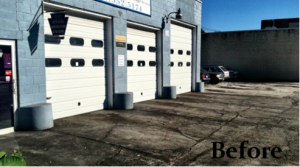 Check out our gallery to see before-and-after photos of our expert work, and when you’re ready, call us at 484-454-3555 to experience the magic of sealcoat for yourself! With winter finally in the rearview mirror, it’s time to look forward to the golden days of summer. Who’s excited? For business owners with commercial parking lots in Delaware County, it’s important to evaluate the state of your lot and check for any issues which may have arisen over the winter. Semi-regular maintenance is a necessity for commercial parking lots. Your lot is a big part of the first impression for your business, and a deteriorated, run-down parking lot may make you look unprofessional to potential customers. What is “semi-regular” maintenance? – The most efficient way to take care of your lot is to maintain it every 2-3 years. Maintaining your lot with a regular sealcoating is much more cost-effective than allowing the lot to deteriorate, which will eventually lead to the need for an expensive complete repaving. Sealcoating will keep your lot looking consistently fresh and save you money in the long run. Expected costs – The cost for a commercial sealcoating job depends on a variety of factors, including the location of the lot, its size, and its current state. The cost will range anywhere from 10-16 cents per square foot, depending on your own unique combination of these factors. What to look for in a sealcoating team – When hiring a professional sealcoating team, it’s important to seek out the right qualities. At Allout Sealcoat, we provide our customers with the ultimate in customer service and quality workmanship. We double-down on this commitment by providing each client with videos of the entire process in order to ensure full transparency. We also have developed a 7-step process that serves as a reliable blueprint for completing our jobs in an efficient and effective manner. Finally, our team members have a genuine passion for their work and treat each project as an opportunity to showcase our workmanship. If you’ve noticed any signs of aging in your Delaware County commercial parking lot, don’t hesitate to begin a restoration project. Keeping your lot freshly sealcoated every 2-3 years will help you avoid costly repaving fees, and help you to project the most professional image to your customer base. 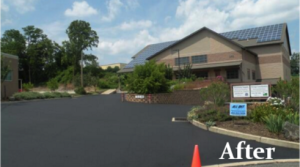 If you’d like to restore your Delaware County commercial parking lot to its full potential, don’t hesitate to contact Allout Sealcoat today. Our experts will communicate with you through each stage of the process and provide you with the highest degree of expertise in the field. To find out more, contact us for a free analysis. We look forward to helping your business grow! Everything from the appearance of your office to the state of your parking lot makes an impression on potential clients. When choosing between multiple providers, which do you think a potential client would be more inclined to select: the provider with a neat, tidy facility – or the provider whose facility shows signs of wear and tear? It’s clear you need to pay attention to the details. Preserve the your New Castle County commercial parking lot with efficient, affordable service from All Out SealCoat. 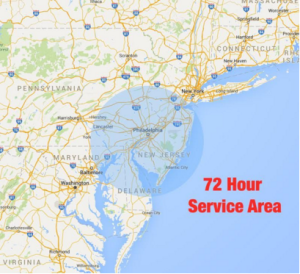 We provide New Castle County sealcoating to many businesses in the region, and we’re trusted with the job thanks to our reliability, transparency, and excellent-quality service. Transparency – Our experts provide the highest quality of service in our commercial sealcoating projects, but we won’t ask you to take our word for it. Instead, we provide videos of the entire process, so that you can be involved and know exactly what you’re paying for. We think this promotes accountability on all ends, and allows for optimal communication with our clients. A 7-step process – We take a methodical approach to our sealcoating projects. Our experts have broken the process down into 7 steps, which act as a blueprint for all of our projects. This ensures we complete each project in an efficient manner, with the highest degree of workmanship. Passion – Commercial sealcoating isn’t just a job for us. Our experts love what they do, and take pride in each and every project. We view each job as an opportunity to showcase our skills and understand each client is trusting us to improve the image of their business. If you’re looking for a reliable New Castle County commercial sealcoating team, look no further than All Out. Our experts will beautify your commercial parking lot and keep you involved with the process. If you’ve noticed that your New Castle County commercial parking lot is in need of a makeover, don’t hesitate to contact All Out Sealcoat today. Our experts will help to restore your lot, so that you can make a good first impression for your customers and avoid the need for a complete repaving in the future. We hope to hear from you soon! Cultivating an appealing public image is a crucial part of any business’ success. This applies to everything, from your advertising campaigns to your employees to the layout of your store or office space. And of course, it applies to your building’s exterior, including your parking lot. During the spring, it’s important to take a look around your parking lot and see if there are any damages from winter, such as cracks or drainage issues. If you discover damages that may discourage your clients in any way, consider our Gloucester County commercial asphalt repair. Full transparency – In order to keep our customers informed of our process, we provide videos of the entire commercial asphalt repair procedure. This way, you can verify we’re providing you with the most efficient and professional sealcoating service available. The best solution for the best price – We’ll do our research to develop the best possible course of action for your specific commercial parking lot. What’s more, we’ll execute our plan at a reasonable rate while maintaining our extremely high standards. Typically, commercial asphalt repair rates run from $2-$6 per square foot, depending on the extent of the damage. A 7-step process – We don’t miss the details when it comes to our Gloucester commercial asphalt repair process. To make sure our job is thorough and complete, we utilize a comprehensive 7-step process unique to our business. Whether you’re in need of a simple recoating or a comprehensive repair for your entire commercial parking lot, the experts at All Out Sealcoating can help. We’ll have your commercial asphalt looking new and professional again in no time. If you’ve determined your commercial asphalt could use an upgrade, don’t hesitate to contact All Out today. Repairing or recoating your asphalt will keep your business’ image clean and crisp. Contact us today to schedule a free analysis. We look forward to hearing from you! If you own a business, you know that maintaining its appearance is a key aspect of success. After all, the way your business looks not only impacts your employees’ performance; it affects the way prospective clients and other important visitors perceive you. Of course, keeping up appearance applies just as much to your business’s exterior as its interior – and that includes the parking lot. If you own a Montgomery County commercial parking lot, we advise you to maintain it at least every two to three years. Regular sealcoating will protect your parking lot from wearing down over time, keeping cracks and other issues at bay. Plus, sealcoating is extremely cost effective, far more so than replacing your parking lot. A sealcoating job costs anywhere from 10-16 cents per square foot, depending on the size of the project, location, and state of the parking lot. Videos – We provide each client with videos of the sealcoating process to promote a sense of accountability. This way, you can witness our premium workmanship and see why we’re the go-to name for sealcoating Montgomery County commercial parking lots. 7-step process – We’ve honed our process to a science, by breaking it down into 7 simple steps. This process serves as a blueprint for each project and allows us to work as efficiently as possible while we beautify your commercial parking lot. Passion in our work – We love the feeling of satisfaction we get from a job well done. We realize that each project is a chance for us to showcase our skills while we help improve the appearance of your business. We’re grateful for the opportunity to help others succeed! We believe these characteristics distinguish us from other commercial sealcoating companies in Montgomery County. Each of our clients can expect to receive full transparency, accountability, and incredible workmanship. If you think your Montgomery County commercial parking lot is in need of a fresh sealcoat, don’t hesitate to contact All Out today. Our sealcoating experts will have your lot looking fresh and new again in no time at all, and you’ll get to watch the process from start to finish. Contact us today to get started on beautifying your commercial parking lot. Owning a business takes a lot of hard work. At any given moment, a multitude of needs are calling for your attention, and there’s always room for improvement even in areas of the business that are thriving. In the midst of the chaos, it might be easy to overlook your business’ exterior aesthetics, particularly your commercial parking lot. But an attractive exterior indicates that you take your business seriously, and it reflects the quality of your work–so this is part of your business strategy not to be forgotten. Video communication – Not only do we consistently provide our customers with excellent workmanship, we keep make sure our clients know the work is being done right. Each of our clients receives a video of our entire commercial sealcoating process, so they can see for themselves our fastidious attention to detail. 7-step process – We take a methodical approach to each of our commercial sealcoating projects. We’ve broken our process down into 7 simple steps, which serves as an easy-to-follow blueprint for every job. 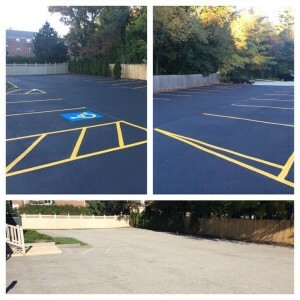 This allows us to work as efficiently as possible while providing you with the best quality of service, materials, and value for your Chester County commercial parking lot. Passion in our work – At All Out Sealcoat, we take pride in being the best option available for commercial sealcoating in Chester County. We understand that beautifying commercial parking lots for small businesses helps improve the local community as a whole. That’s why we treat every project as an opportunity to showcase our skills. If you’ve noticed that winter has taken a toll on your Chester County commercial parking lot, don’t hesitate to take action. Commercial parking lots should be maintained every 2-3 years, and waiting longer can cause complications. The team here at All Out Sealcoat can assist you in restoring your commercial parking lot to pristine condition, at a reasonable rate of 10-16 cents per square foot. If your commercial parking lot is need of a revamp, we’d love to hear from you. Our experts will provide you with the highest quality of commercial sealcoating in Chester County, including video of the entire process. Contact us today to get started on beautifying your commercial parking lot! If you’re a business owner, you’re familiar with the concept of protecting your investments. This extends even to what some may consider minor details, such as your commercial parking lot. Maintaining a well-kept appearance is an important aspect of any business. As a result, allowing the asphalt of your parking lot to deteriorate could not only lead to accidents, drainage issues, and other problems; it could be making a terrible impression on your customers. At All Out Sealcoat, we believe in perfect workmanship down to the finest details. That’s why we only use the highest-quality materials for our sealcoating projects, both residential and commercial. Furthermore, our products are approved by the Federal Aviation Administration for use on airport runways – so you can rest assured they’ll be more than sufficient for your business’ parking lot. Video accountability – Along with premium materials and workmanship, we video our projects to share with our clients. This adds a layer of accountability to our services and provides clients with peace of mind that the job is being completed correctly. A 7-step process – We are extremely methodical when it comes to our process for sealcoating commercial asphalt in Delaware County. Honed through many years of experience and expertise, our process maximizes efficiency while rendering the best possible quality. Passion and pride – Sealcoating isn’t just a job for us; it’s a passion. We take each project very seriously and view it as an opportunity to showcase our skills and help other local businesses reach their full potential. Our business is your success. When you partner with All Out, you can feel confident you’re receiving the ultimate combination of materials, service, and workmanship. Contact All Out For Delaware County Commercial Sealcoating Today! If you’ve noticed that your Delaware County commercial parking lot is in need of a makeover, don’t hesitate to act. The best way to maintain the wellbeing of your parking lot is to start sealcoating as soon as possible, and to schedule regular sealcoating sessions every two years or so. Contact us to get started on restoring your Delaware County commercial asphalt today. We can’t wait to help you! Line Striping in the world of asphalt is also known as pavement marking, Re-Striping & simply Striping. It, like baking a cake, is applied to the surface once you have laid down a nice foundation. I know that might sound like a stretch right off the bat but let’s take a few seconds to compare the two. First and Foremost, a great paving job can be completely ruined if your parking lot is incorrectly marked. It’s the “icing on the cake” portion of the job. It would be like baking a phenomenal strawberry short cake and then putting basil pesto icing on the top of it. Not only is that a violation in all cuisines, it would undoubtedly ruin the entire cake. The only way you could possibly save it would be to take a knife and very carefully remove it from the places it was applied. So imagine just having a perfect sealcoating job done on your parking lot and then had it striped completely wrong. Just like the cake, you would have a huge problem. That is why it is essential to pay attention to the following points for the next time you take a look at your parking lot. Your parking lot has to be properly marked. Not only is your lot being judged by your customers and potential clients, more importantly it is required by Law. All States have code enforcers who check parking lots and issue fines if the lot is not meeting code. Each state also has their own set of rules and laws of how a lot should be striped. Make sure the contractor you choose has the specifications provided by the state prior to sealing your lot. It is also dangerous and could lead to a lawsuit to not have the lot properly marked as it will lead to confusion to the people driving on it. It is critical to properly re-stripe the lot as it keeps your property looking its best, but also preserves a safe and functional business environment. Re-striping becomes necessary when the paint starts to degrade from being exposed over time to water, oil, lubricants and the sun. When the parking lot is located in a high traffic area, you may need to re-stripe your parking lot on a yearly basis. If not, re-striping should be done every other year. The best plan of action is to keep an eye on your parking lot and to not ignore or put off re-striping the lot. When you notice that the arrows pointing your customers in the right direction are hard to see, you should proactively seek to find a qualified contractor to stripe the lot. You may notice that old lines are showing through the seal coat. This means that it is time to sealcoat and then re-stripe the parking lot as well. So here’s the kicker to this blog post. When you call/email us for a free estimate today, make sure to mention “icing on the cake”, we will make sure to bring you a free cake to our first meeting 🙂 ! Parking lots can be sealed with either asphalt or coal tar emulsion pavement sealer with a price ranging from $0.15 – $0.25 per square foot. The price of Sealcoating depends on many variables and factors. It is absolutely vital to properly qualify a contractor first and then consider the price presented to you when collecting proposals. Contractors must be able to prove to you that they are capable of seamless communication throughout the entire sealcoating process. In order to have a sealcoating job done on time and on budget, your contractor needs to have a staging process in place and backup plan in the event the weather does not cooperate. In order to seal a parking lot, temperatures must be consistently over the mid 50s and it cannot rain while sealcoating or during the curing process. The curing process of sealer can range from 20 minutes up to 24 hours. It depends on how high the temperatures are, how much sunlight exposure there is, and humidity levels. Contractors assume the risk and must have up to the minute weather reports the day of the job to insure that sealer is being applied during the appropriate time. The amount of mobilizations directly affects the price of sealcoating a parking lot. Typically a parking lot will have 2 mobilizations to complete the job which is built into the original cost. However, in the event that is it not possible to complete a parking lot in 2 phases, anticipate an extra mobilization charge of equipment and crews ranging from $500 – $1,000 for each day. The condition of the parking lot and how dirty it is affects the price. You must consider the amount of cleaning and the extra time it will take using powerful air blowers and steel wire hand brooms to prep the lot for a sealcoat. It is vital to have the asphalt clean prior to applying sealer for it to properly adhere. Also the amount of oil spots the lot has is another factor to consider as preparation and priming with a latex based oil spot primer is required prior to sealing over those areas. The layout of the Parking Lot is another factor to consider. Wide open parking lots can be done in optimal time and cost much less when it is possible to use a sealcoat truck equipped with a spray bar. However, it is not always possible to apply with this method and often times contractors must apply sealer by hand which takes much longer. The most important factor to price is the ability to select the best contractor for the job. When collecting proposals pay careful attention to what is being presented to you. Many contractors pose to be legitimate professional sealcoating contractors and that is not always the case. Make sure they show proof of liability, automobile and workman’s compensation insurance. Ask to see pictures of their crews and make sure they are not using illegal workers on the job. Ask to see specifications of the sealer they will be applying. Selecting the cheapest contractor will end up costing you more money than selecting the best contractor for the job. ALL OUT Parking Lots is a contractor you can trust to be the best contractor for you. We act as strategic parking lot planners. We provide and produce the best solutions to maximize the life expectancy, accessibility, and beauty of parking lots. We specialize in sealcoating, pavement marking, concrete, repaving, and asphalt repair. Most importantly we implement maintenance programs that are engineered to save our clients’ money, and keep their properties looking great. We are successful because we do not sell. We listen, comprehend, and then utilize a reliable 7 Step Process. Step 1 begins when you send an email to marco@alloutparkinglots.com to inquire about your parking lot.